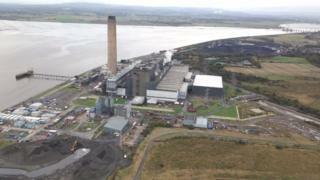 Scottish Power has announced plans to close its huge coal-fired power station at Longannet in Fife early next year. The move comes after the energy firm failed to win a crucial contract from National Grid. Scottish Power said it was "extremely disappointed" at National Grid's decision. It had previously indicated Longannet would have to shut if it lost out in a contest to help maintain voltage levels in the nation's electricity supply. The SSE-operated gas-fired power station at Peterhead won the contract at the expense of Scottish Power and a third bidder. The Scottish government said it would hold urgent discussions with Scottish Power, Fife Council and unions about Longannet, which employs about 270 people. MSPs heard earlier this month that Longannet would close unless Scottish Power secured the £15m contract, which will run from April 2016 to September 2017. Longannet power station is a bit of a monster. At 2,400 megawatts capacity, the huge plant on the banks of the Forth can keep the lights on for most of Scotland. Recently, it's been sweating its 42-year-old sinews to do so, particularly when the wind drops and all those turbines stop supplying the power grid. Its days were numbered, however. While burning all that coal, it was facing a steeply-rising bill for emissions. And once it has burned through its licence conditions, it was due to close in 2020. That was the intention of government policy, and it has had cross-party support. However, that date is almost certain to be brought forward to March 2016, following Longannet's failure to win the National Grid auction for back-up supply to ensure voltage remains steady. Scottish Power retail and generation chef executive Neil Clitheroe said: "We are extremely disappointed with National Grid's decision as Scottish Power submitted a competitive bid that reflected our commitment to protecting the immediate future of Longannet Power Station. "As we have said previously, today's decision by National Grid means that, in all likelihood, we will be forced to announce the closure of Longannet by March 2016. "Everyone will appreciate that it is a concerning time for all our people and we will do everything in our power to manage the outcome of this process as best we can. "The issue regarding punitive transmission charges has not changed, and this still negatively impacts the future of the station. "Beyond that, the current transmission charging regime is a major barrier to any future investment in flexible thermal power generation in Scotland." He added: "In any future scenario for Scotland, it is vital that the network here is supported by flexible generation to complement renewables." In a statement, National Grid said Peterhead had been selected because its proposal was "determined to be the most beneficial across a number of factors". It added: "These include the ability to provide system stability and resilience, and value for money for GB consumers. "The baseline value of the contract is £15m, and any utilisation fees will be reflective of market conditions at that time." SSE said the National Grid announcement was "positive news" for Peterhead. Jim Smith, managing director of Energy Portfolio Management for SSE said: "SSE has continually invested in the site since it opened in 1980 and we're pleased Peterhead will continue to play an important role in ensuring National Grid can provide system stability and resilience going forward." The contract allows National Grid to call upon 385MW of Peterhead's 1180MW capacity to provide voltage support. Scottish Energy Minister Fergus Ewing welcomed the award of the contract to SSE's Peterhead power station, but said he was disappointed at the premature closure of Longannet. Mr Ewing said: "First and foremost my thoughts are with the hundreds of direct employees at Longannet power station, and the many more who are dependent on the plant." He added: "We will look to engage all relevant authorities and agencies alongside Scottish Power to secure the best possible outcomes for those affected throughout the local economy and further afield. "This activity will require cross-party support and close working between all of the relevant authorities." A spokesman for the Department of Energy and Climate Change said: "The awarded contract is good news for Peterhead, a plant that is developing CCS technology which will help towards our carbon emission objectives. This will also help maintain high levels of electricity security for Scotland. "Next year's possible closure of Longannet is unwelcome news for the workforce and the UK government will do everything possible to assist them. "The Department for Energy and Climate Change takes security of supply very seriously and has worked with National Grid to put in place an effective plan to secure electricity supply. "National Grid have confirmed they continually assess the risks to security of supply across GB and have the tools to address any issues, including major plant closures, that emerge both nationally and in Scotland." Dunfermline and West Fife Labour MP Thomas Docherty said the announcement was "extremely disappointing news for the workforce, their families and the wider community around Kincardine". He added: "For six decades coal power stations have operated in Kincardine, powering hundreds of thousands of homes and businesses across central Scotland. "We have known for sometime that Longannet would cease generating due to the age of the station, the decision by its owners not to make the necessary investment and the SNP's obsession with renewables driving Longannet out of the Scottish market. "However we must now focus all our efforts on helping the community to adapt." Scottish Conservative energy spokesman Murdo Fraser said it was "a very serious blow" for the workforce at Longannet and for the wider economy. He added: "We have always known Longannet was going to have to close, but it's disappointing this has been brought forward. "It illustrates once again why the Scottish government has to change tack on energy policy." Gina Hanrahan, from WWF Scotland, said National Grid's announcement was "another important step in Scotland's energy transition". She added: "While Longannet has served Scotland well for over 40 years, it is Scotland's single biggest source of climate emissions and a combination of EU air pollution rules, carbon pricing and factors such as transmission charging have made the aging plant's closure inevitable. "However, National Grid have made clear that this does not pose problems for security of supply in Scotland and has taken very prudent steps to ensure grid stability with this short-term voltage control contract for Peterhead." Longannet is one of the biggest coal-fired power stations in Europe. It generates enough electricity each year to meet the needs of more than two million homes and it plays a vital role in keeping the power network stable and safe.